Welcome to Just Smokin' Around Catering, LLC. Started in 2005 as a local BBQ team competing in various BBQ contests around the country now offering catering and concessions specializing in slow smoked using real wood barbequed meats. In 2005, Bob and Bill, whose passion and enjoyment of the great taste of food and smoked/BBQ’ed meats have brought us together to form a BBQ team. Since our primary purpose is the fun and enjoyment of producing the best barbeque meats we can, we saw ourselves as just a couple of guys who were “Just Smokin’ Around”, hence the name. When opportunity knocks, we get together, drag our smokers (and tons of other stuff!) to these competitions or collect a bunch of friends and co-workers and have a great time creating the best tasting meats we can; taking in the wonderful hardwood aromas as brisket, pork and chicken absorb the array of exotic and foreign spices that enhances every tender piece of meat. Win or lose, our love and passion for good food will always make for a memorable time. In 2008 Bob expanded Just Smokin' Around Catering, LLC to providing this same experience to other by starting to sell these award winning slow wood smoked meats to the public through concession at events through out the area. Let us provide our slow smoked meats and delicious side dished at your never event. Chef Bob is currently a computer programmer that has been a fan of outside grilling for many years. Enjoy cooking and eating grilled meats and vegetables. Grilling outside is a form of stress relief and relaxation. In 2004 Chef Bob attended a class on grilling which turn out to be a class on competition in BBQ competitions getting his first introduction into the world os slow smoked/BBQed meats. In 2005 along with friend and co-worker, Bill, they formed the BBQ competition team "Just Smokin' Around" and enter the competition world. During this time Chef Bob also attended the local community college where he received a certificate in Culinary Arts. He began helping at his friends restaurant, Zest, until it closed a few years later. Over the years friends have asked Chef Bob to cook various items for their parties and event. The company that Chef Bob and Bill work for even began to use their grilling and barbecuing abilities to supply the food for various events, picnics and holiday lunches. 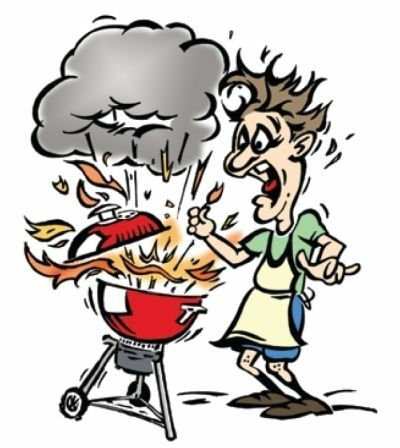 In 2008 a fellow concessionaire suggested that Chef Bob come along with him and sell BBQ at a local car show which started Chef Bob down the path of providing slow smoked meats are various events in the area. Hire Us - Award winning slow smoked meats.